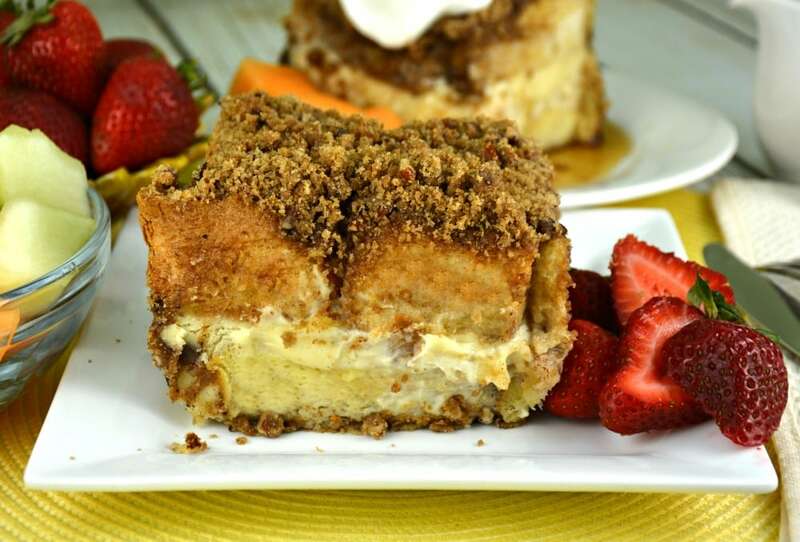 This recipe for the Best Overnight Cream Cheese Stuffed French Toast is by far our favorite breakfast treat around here! I can’t decide whether my favorite part is the cream cheese filling in the middle or the crumbly topping all over the top! Both are nothing short of perfection! You need to use a pan or casserole dish that is at least 2 1/2 inches deep and at least 8 inches long by 8 inches. 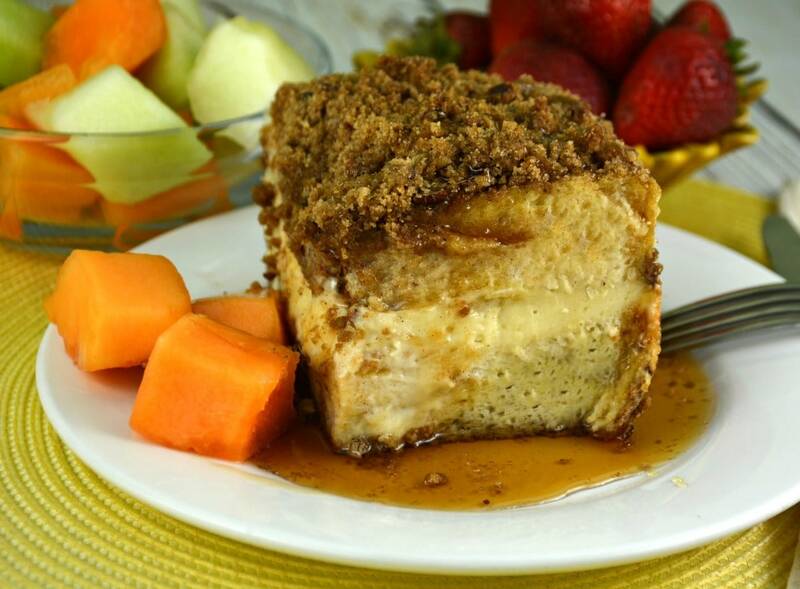 I have a special french toast dish that I always use to make The Best Overnight Cream Cheese Stuffed French Toast. Feel free to cut up the bread slices to make them fit as best you can. Also, if you use a larger pan, feel free to add another scrambled egg or two if the mixture doesn’t come up to at least the midway point of the bread. Specifically, you need to be sure the egg mixture covers the cream cheese mixture in whichever pan you use. We are huge french toast fans in this house and I have included links below to some of our other favorites. Hopefully you have a moment to take a peek at those recipes as well! 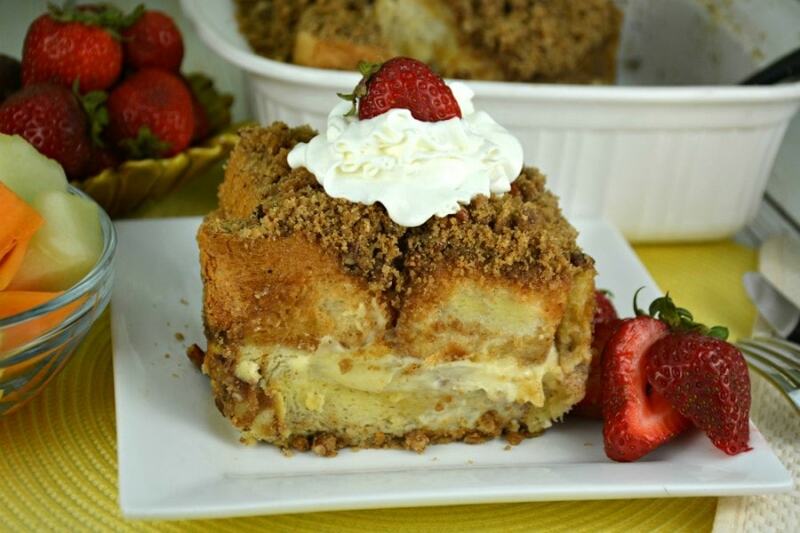 Banana Chocolate Chip Caramel French Toast Bake You have so many options when serving The Best Overnight Cream Cheese Stuffed French Toast. 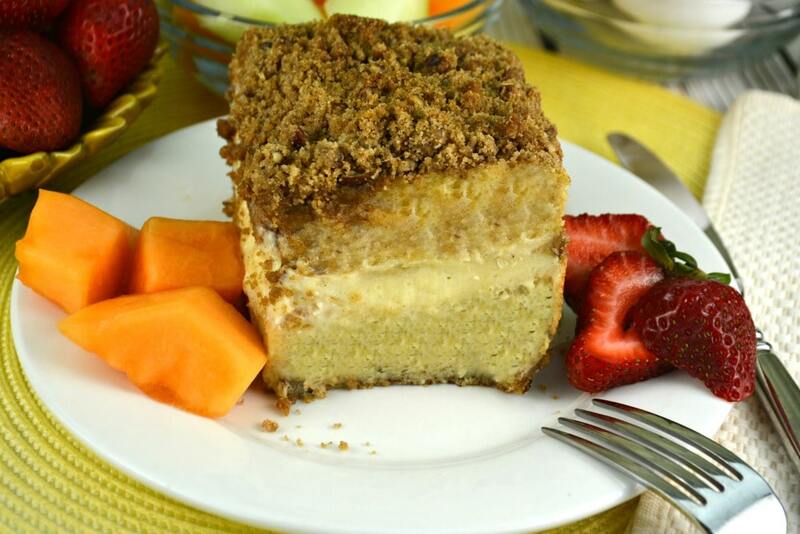 You can serve it with syrup, fresh fruit and ice cream or whipped cream. The possibilities are truly endless. Check out our video below and you will be able to see exactly how this wonderful dish is made! Prepare your deepest 9x9 inch casserole dish (as close as you can get!) or baking pan lightly coated in cooking spray. If you are using a pan of a different size you may have to adjust the number of eggs and the amount of cream and milk so that there is enough to coat the bread. You can add anther egg or two at the end if you even need it! Set aside. In a medium sized bowl combine softened cream cheese, sugar, vanilla, egg, and flour. Whisk until well blended. You can also use a handheld or stand mixer to make blending easier! Set aside. Place slices of bread across the bottom of your prepared pan. Use half slices of bread and smaller pieces to fully cover the bottom of the pan. Spread your cream cheese mixture on top of this layer of bread. The cream cheese layer will be thick. Place remaining bread slices on top of the cream cheese mixture in the pan. Try to overlap the bread in a different pattern for the top layer. Set aside. In a large mixing bowl combine eggs, milk, cream, vanilla, cinnamon and nutmeg. Once mixed pour slowly over bread and cream cheese. Try to coat all of the bread pieces as much as possible. Using a butter knife adjust and lift bread slightly at the outer edge, to allow egg mixture to flow between bread slices. Cover pan with aluminium foil and refrigerate overnight. When you are ready to bake remove pan from the fridge and keep on the counter to rest for 30 minutes before baking. Grab a medium sized bowl and combine brown sugar, butter, cinnamon, and flour. Mix with a fork or your fingers until crumbly and well combined. Once the butter is totally mixed in add the chopped pecans. 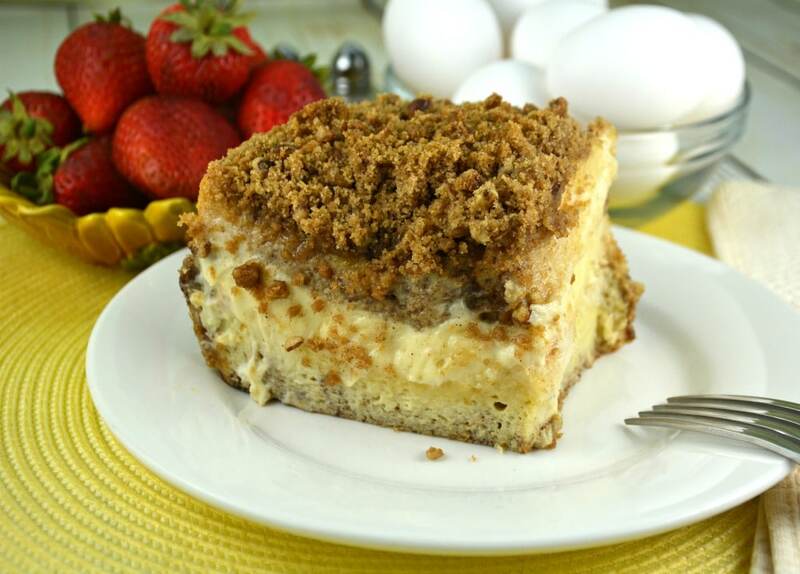 Cover the bread in your prepared pan with the streusel topping. Bake for between 45-60 minutes, until golden brown. A toothpick should come out clean when inserted into the center of the pan. Cut into slices. Serve with a dusting of icing or powdered sugar and fresh fruits, whipped cream, chocolate chips or maple syrup. Enjoy! Amazing recipe. Grandkids loved it. Will definitely keep it to do again. Thank you for sharing it. Can’t wait to make this again. Mixed strawberries with the cream cheese and loved it. Thank you for sharing this recipe!!!! Can’t wait to try your chocolate banana French toast next. Best French Toast ever. Perfect for my brunch. Everyone loved it and asked for the recipe will definitely make again. Love your site! LOVE THIS!!!!! THANKS 4 SHARING!!! !